While alligators are usually shy and encounters with people are rare, during mating season males wander outside their usual territory, leading to frequent run-ins with people. Courtship begins in April, followed by mating in May and June. During these months alligators also become generally more aggressive. It takes about 2-3 months to hike all 1,100 miles. If you start during the first week of January, you will likely finish sometime in March. Should You SOBO or NOBO? January temperatures in North Florida can drop below freezing and weekly cold fronts bring icy rain. A southbound (SOBO) hike beginning in January would be a wet, freezing, miserable endeavor. 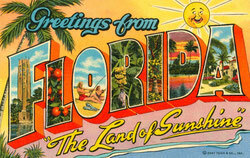 By March, south Florida is broiling. A SOBO thru-hiker who started in January would reach Big Cypress at the onset of dangerously high temperatures, as well as swarms of insects. In contrast, January temperatures in the absolute far south of the state are mild, even warm. You will be surprised how hot Big Cypress gets in January, but it's nothing compared to summer. Hiking north keeps you aligned with mild temperatures. Unlike most other National Scenic Trails, the official Florida Trail has loops and alternate routes that make the traditional "purist" concept of a thru-hike impossible to apply. To successfully hike the "whole trail," you need to abandon the idea that you could actually hike every foot of trail that has been blazed orange. We've all heard about guys on the AT who never took a blue blaze or loop trail because they insisted they wanted to hike "the whole AT." Get that idea out of your head and don't listen to anyone who says you have to hike a specific route in order to be a "real FT thru-hiker." On the Florida Trail, the meaning of "hike your own hike" is taken to new extremes. With so many options and loop trails, any route you choose is your thru-hike. Left or Right Around Lake Okeechobee? 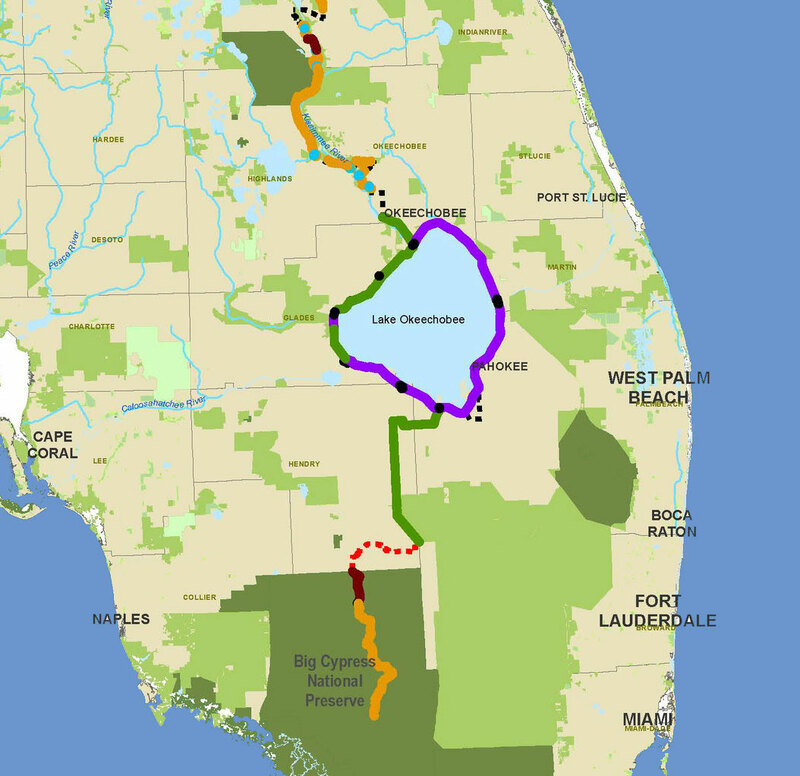 The official FT route encircles all of Lake Okeechobee, and so thru-hikers approaching from the south have to choose whether to go east or west around the lake. The lake, second largest entirely within the US, is ringed by the massive earthen Herbert Hoover Dike. The trail goes along the top of the dike, but so does a paved bike path. 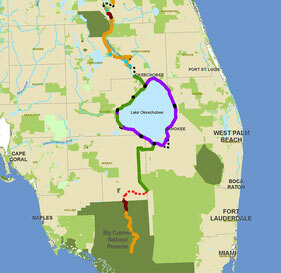 In the picture to the right, the purple represents paved trail, while green is unpaved trail. At the moment there is less pavement on the western side, but that is changing. Plans are in the works to pave the entire path. The east and west routes also have different views. Huge marshlands border the western side of the lake, and rarely will you see open water. However you will see a lot of birds. The eastern side provides great views of the open water, but has fewer birds. Finally, the Herbert Hoover Dike is in a constant state of repair by the Army Corps of engineers. Construction means the path is closed and the trail detours onto roads. As of 2014/2015, there is less construction, and hence fewer roadwalks, on the western side. East or West Around Orlando? The official trail route makes a huge loop around the Orlando area. The biggest decision the thru-hiker has to make is whether to go east or west around Orlando. In the map to the right, orange represents trail through wild lands, while dotted lines represent road walking. So while the western route goes through gems like the Green Swamp, the Withlacoochee State Forest, and the Cross Florida Greenway, a NOBO thru-hiker faces 64 miles of continuous road walking at the very beginning of the western route. Both options have roughly the same amount of roadwalking, but 64 unbroken miles is a bit daunting, and so most hikers go east. Finish in Alabama or at Fort Pickens? 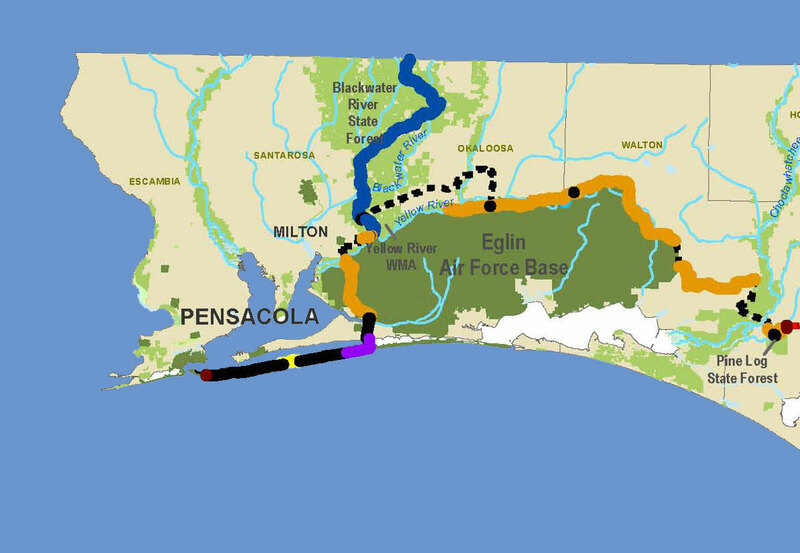 Near the end of Eglin Air Force Base section, in the town of Harold, the trail reaches an intersection and hikers can turn north into the Blackwater River State Forest or south to eventually reach Ft. Pickens. The turn into Blackwater is a connector that ties the Florida Trail to the Eastern Continental Divide Trail. The traditional FT thru-hike route heads south and ends at Fort Pickens.